There's more than a $10,000 price span between the base LX and the top-of-the-line 2011 Honda Odyssey Touring Elite. Drive them both, and you might decide that you can do without all those extra entertainment and luxury features. The 2011 Honda Odyssey remains the best-handling of the minivans, with some of the most innovative seating configurations and entertainment features, but it's also the priciest. 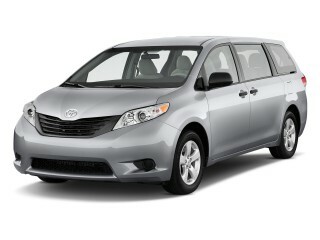 Honda is targeting younger Gen X and Gen Y families for the first time with the 2011 Odyssey, and it shows. 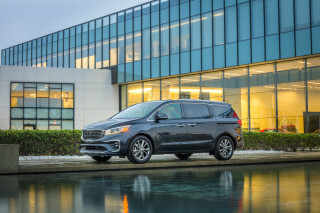 While preserving the Odyssey's status as the perkiest-driving minivan, Honda has improved seating and interior space, made more provisions for child and booster seats, and added new connectivity and entertainment options that make this minivan a better place for busy parents and kids. Of course, most of these people who reject simply reject minivans, and probably mutter something about how they wouldn't be caught dead in one, probably don't know that most minivans actually drive better than SUVs—even, in many cases, midsize crossover utes. The responsive-driving and cleverly packaged Honda Odyssey has always been one of the best examples; climb behind the wheel, and you're quite likely to become a minivan convert. 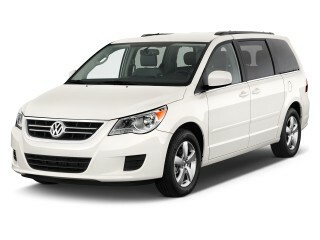 The Odyssey's look is evolutionary, for sure, but its new lightning-bolt beltline is a bit controversial. While pictures don't always do it justice, we think the new cue, which drops the beltline a bit just behind the sliding door, adds style as well as function, with third-row passengers getting a bit more window space—and accommodating the slightly curvier roofline and thicker back pillar that's common to other Hondas like the CR-V. There's not a lot of news regarding the powertrain or the way the Odyssey drives, and that's a good thing. The 2011 Honda Odyssey carries over the same 3.5-liter i-VTEC V-6 engine, here making 247 hp; top Touring and Touring Elite models of the new Odyssey get a new six-speed automatic transmission, while the rest of the line does just fine with a five-speed. Vans with the six-speed, however, are the best on fuel; they get ratings up to 19 mpg city, 28 highway, and all Odyssey models now have Variable Cylinder Management to save gas and active noise cancellation to bolster the Odyssey's already quiet and refined interior. Handling is top-notch, and you can drive an Odyssey on tight, twisty roads with the same verve as you would a sporty sedan. The Odyssey is absolutely loaded with thoughtful touches. Three rows of seating are now even better for six adults, thanks to a new second-row configuration that allows the outboard seats to actually tilt and slide outward—changing the width of the second row depending on whether there are two adults, three, or a combination of child seats there (there are now five sets of LATCH connectors, for child seats). The third row gains an inch of legroom and in some trims an armrest, while its folding mechanism gets even better. Connectivity is much-improved, with new iPod and USB interfaces now included with the top sound system, but a Bluetooth hands-free interface is still the exclusive domain of top trims. 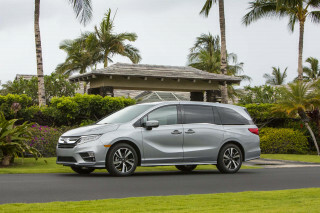 In typical Honda fashion, some of the top features, such as a blind-spot system, auto-leveling HIS headlamps, and a new hard-drive-based music system, are the exclusive domain of top 2010 Honda Odyssey Touring and Touring Elite models. The new navigation system receives free FM-based traffic updates, voice commands have been dramatically upgraded, and the stunning wide-screen entertainment system has a first-in-class HDMI input, to hook up media players or laptops. The 'lightning bolt' adds a little flair, and perhaps a little controversy to the styling of the 2011 Honda Odyssey, but overall its design is evolutionary. While the Odyssey's space-efficient, box-on-wheels intent is unmistakable, from straight ahead and behind, the Odyssey's look is surprisingly conservative, with strong influences from Honda's cars rather than trucks. From the side, it's more interesting; the Odyssey gets a sleeker look, with a slightly more arched roofline, brightwork accenting all around, and most notably, the "lightning bolt" hump along the rear window—complemented by a sculpted (aerodynamically functional) rear fender. While the Lincoln MKT has a comparable beltline rise, the Odyssey's drops down, to give the third row more glass. In front, the small front windows, ahead of the doors, are a functional cue shared with Honda's small cars. Inside, the changes are evolutionary at first glance. Although materials are completely new, the instrument panel hasn't really changed much in structure. 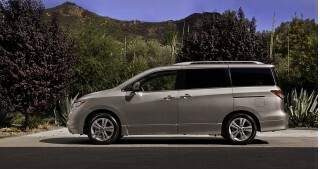 Honda kept to a "cool and intuitive" theme and aimed to make the Odyssey a little easier to operate. That, officials said, meant keeping knobs and buttons large, as well as high enough. While the Odyssey might not be the fastest in its class for acceleration, it's the best-steering, best-handling minivan, and it's more fun to drive than it looks. The powertrain in the 2011 Honda Odyssey is familiar—a variation of the same 3.5-liter i-VTEC V-6, here making 247 horsepower and 250 lb-ft of torque. The slight power and torque gains come via a new two-stage intake and cold-air intake system. While all Odysseys come with the same engine, top-of-the-line Touring and Touring Elite models get a six-speed automatic and the rest of the line gets a five-speed auto. Fuel economy ratings are improved by two to four miles per gallon—to as high as 19 mpg city, 28 highway—through aerodynamic improvements, improved accessory management, and an improved Variable Cylinder Management system, also featured across the line, that will run the engine on as few as three cylinders during coasting or low-speed cruising. Honda couldn't do any better with a four-cylinder engine, an official said, so don't hold out for a smaller engine. Considering the Odyssey's 21-gallon fuel tank, it should be good for at least 500 miles of highway cruising, if your bladder can make it. Acceleration isn't quick, but it feels fast enough; with the six-speed, the Odyssey can get to 60 mph in 8.8 seconds, according to Honda. That's technically a slight bit faster than the Sienna V-6. Not all is perfect about the powertrain. Transmission behavior, as we've found in other Honda products, can be obstinate at partial throttle. If you're puttering around town, rolling through a stop sign causes a moment of hesitation as the slushbox debates about which gear to pick; the same thing happens in the higher gears when you're getting back on the gas out of a sweeping corner in Drive. There's no way to command individual gears, just the confusing combination of an 'L' mode as well as an O/D-off button on the selector. Of course, drive with your right foot mashed to the floor and the shifts are decisive, quick, and smooth. Although the Odyssey is much more closely related to the Pilot SUV, it really handles a lot like a V-6 Accord. We don't know how they do it, but the engineers manage to set this minivan corner with remarkable poise. The suspension, isolated with separate front and rear subframes, really works, omitting the sorts of queasy secondary motions that plague most of the SUV field, along with some minivans, while quelling road shocks. Part of the success could be weight control—Honda managed to actually cut about a hundred pounds from the loaded Odyssey Touring (or 50 pounds off the base model) versus 2010. Steering remains excellent. The Odyssey has a variable-displacement power-steering pump that works splendidly, providing more power assist at parking speeds and less at higher speeds, with more effort and even a little feedback in tight twisties. We noticed very little difference in cornering feel between an EX test vehicle and a top-of-the-line Touring Elite, though the slightly harder-compound, taller sidewall tires that came with the EX were far more vocal. On a twisty road, we were left wishing for more lateral support from the front seats, along with more mid-back support. For families carrying adults or kids alike in the second or third rows, the 2011 Honda Odyssey remains more comfortable and versatile than ever; it's still the closest thing to a living room on wheels. Interior versatility, space, and comfort is of course one of the most important aspects for nearly any minivan shopper, and the 2011 Honda Odyssey remains at the leading edge of the segment in this respect; it's absolutely loaded with thoughtful touches, and the seating layout has been revised yet again to make the second and third rows even better for full-size adults while maximizing the number of positions (up to eight) for kids or child seats. Although the basic footprint hasn't changed, the new Odyssey is a little bit wider and lower than the model it replaces, making it very slightly roomier inside. The three rows of seating in the 2011 Odyssey are now even better for six adults, thanks to a new second-row configuration that allows the outboard seats to actually tilt and slide outward—changing the width of the second row depending on whether there are two adults, three, or a combination of child seats there (there are now five sets of LATCH connectors, for child seats). The third row gains an inch of legroom and in some trims an armrest, while its folding mechanism gets even better. Now, with a hand-held strap, you can fold either section of the seat into the floor with a single motion. Honda didn't bother with a power-folding third row arrangement, as all the ones that it tried took longer to deploy and were unnecessarily complicated. Honda's system is simple, elegant, and easy enough to do even with an arm of groceries. The spare tire has been relocated from beside the third row to under the floor in the middle space between the first and second rows. This not only helps keep a lower center of mass but also allows a wider third-row bench. The third row is still a little more confining, for headroom particularly. While this 6'-6" editor fit well enough to be good for quick trips in the third row, I would have been happy all day in the second row. One of the most frequent requests from Honda Odyssey owners was for a better front center console arrangement. Honda designed one this time that's completely removable. With that front-row console removed, you can now fit two 10-foot-long 2x4 studs into the Odyssey., and of course with the second row out of the way you can fit 4x8 plywood. Also among the new features are a media drawer with damped opening, and a cooler compartment below good for several beverage containers. There's also a nifty a trash-bag ring that allows plastic shopping bags to be locked down and used as a trash bag. Fussing kids and entertainment needs aside, the Odyssey is a surprisingly quiet, refined place—thanks to some high-tech wizardry. Active noise cancellation and active engine mounts, two of Honda's trump-card technologies that only made it to top trims of past Odysseys with cylinder deactivation, are standard equipment in all trims of this version. These systems help quell any of that powertrain roughness, as well as some road noise, electronically in conjunction with traditional noise abatement to keep the cabin hushed. 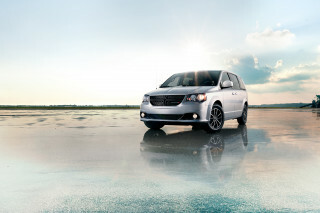 The Odyssey's top results in all U.S. crash tests say it all; this is one of the safest family vehicles at any price. In addition to top five-star results from the federal government and the IIHS in all crash tests, the Odyssey is an IIHS Top Safety Pick and has a great record for occupant protection. Its great handling also likely helps it avoid accidents. Honda claims a class-leading six tether locations and five LATCH locations—the latter are the official clips for child seats. Officially, you can fit four child seats of any kind—two in both outboard positions of the second and third rows. But if they're narrow enough, you can mount three across in the second row and two in the third—for a capacity of five child seats. 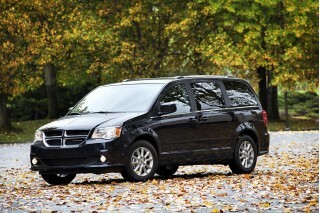 And that's really two more than most other minivans and SUVs. The new Odyssey includes Honda's Vehicle Stability Assist (stability control) system and anti-lock brakes, plus driver and front passenger side airbags and three-row side-curtain bags. In front, there are active headrests. The 2011 Honda Odyssey has some desirable, innovative interior features; but the most desirable tech ones—including Bluetooth—are only available on the pricey, top-of-the-line trims. Honda markets its vehicles a way such that there are few, if any, standalone options. In order to get desirable luxury or tech features, you need to step up to pricier models—like the top Touring or new Touring Elite models. It's more than a little disappointing that those getting an LX or EX have to do without Bluetooth hands-free calling altogether, unless they go for a typically-inferior aftermarket system. The base LX starts at $27,800 ($780 destination) and includes lots of standard equipment such as air conditioning with front and rear controls, cruise control, an eight-way power driver's seat, power windows, locks, and mirrors, and a 229-watt sound system with subwoofer. The EX adds alloy wheels, heated side mirrors, HomeLink, the removable front center console and flip-up trash-bag ring, 2 GB of flash music storage, a tri-zone climate control system, and second-row sunshades. EX-L models get leather upholstery and trim plus heated front seats, an eight-inch screen display, rearview camera, power moonroof, cooling box, Bluetooth, and an added utility tray. The six-speed automatic comes with the Touring model, along with an entertainment system, a 115-volt power outlet, wireless headphones, acoustic windshield glass, memory mirror settings, and sunshades as well as a center armrest for the third row. Touring Elite models, at the very top of the lineup and approaching the $45k mark, add a 650-watt sound system with hard-disk storage, the ultra-wide-screen system, theater surround sound, HID headlamps, and a blind-spot information system. Touring Elite models now come with a blind-spot system. The new hard-drive nav system includes a built-in Zagat guide, a huge points-of-interest database, high-contrast VGA display, and free FM-based traffic information. Plus you can load a personal picture to use as wallpaper with the system. Honda says the fuzzy logic for the voice commands is much improved. Honda has also opted to do away with the ubiquitous 6-CD changer entirely, replacing it with 2 GB of flash storage in EX and EX-L models and 15 GB of hard-drive space in navigation-equipped models. Honda says that this holds the contents of 18 or 175 CDs, respectively. Another standout is the new 16.2-inch wide-screen system provides entertainment and can even split the screen in half for two separate inputs. According to Honda, it's the first OEM system—from any brand, luxury included—to offer an HDMI input. 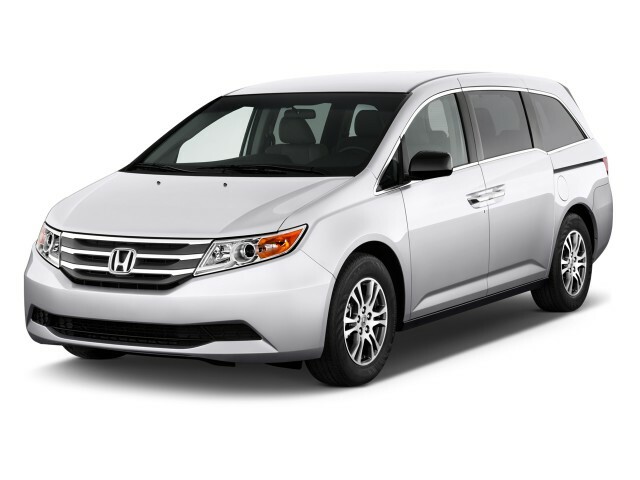 Best-in-class fuel economy ratings make the 2011 Honda Odyssey one of the greenest choices if you have a large family to haul around. 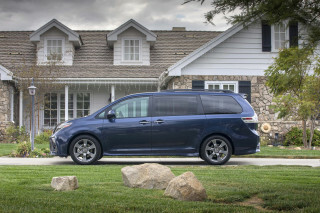 The Honda Odyssey has improved fuel economy ratings for 2011—thanks to the broader application of the automaker's Variable Cylinder Management system, which will shut down two or three of the six cylinders when cruising or coasting to help save fuel, across the entire model line. Odyssey LX and EX models now carry an EPA rating of 18 mpg city, 27 highway, while Odyssey Touring and Touring Elite (which have a six-speed, rather than five-speed, automatic transmission) get 19/28 ratings. That makes it best in class, and several miles per gallon better on the highway than its leading rivals, like the Toyota Sienna and Dodge Grand Caravan. 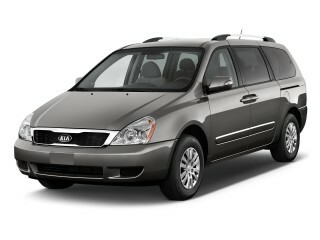 Top Odyssey Touring models are better overall than the base four-cylinder Sienna. The Odyssey's fuel economy numbers also rate better than those of any non-hybrid mid-size crossover SUV with three-row seating.